From the website: Our world is more complex, dynamic, and interdependent than at any time in recent history. Despite current financial, geopolitical and environmental turmoil, we also live in a time of great optimism – about what can be known and what can be accomplished, about our potential to discover and innovate. 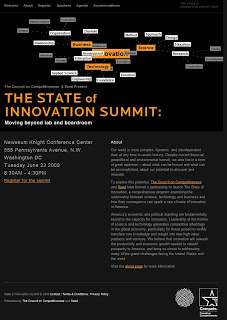 To explore this potential, The Council on Competitivenessand Seed have formed a partnership to launch The State of Innovation, a comprehensive program examining the relationship between science, technology and business and how their convergence can spark a new climate of innovation in America. America’s economic and political standing are fundamentally bound to the capacity for innovation. Leadership at the frontier of science and technology generates competitive advantage in the global economy, particularly for those poised to swiftly translate new knowledge and insight into new high-value products and services. We believe that innovation will unleash the productivity and economic growth needed to rebuild prosperity in America, and bring us closer to addressing many of the grand challenges facing the United States and the world.